Being able to tie yourself up with rope is a good bar trick and also a good skill for the aspiring magician or professional escapist to know. It's also fairly dangerous, because if you do too good a job, you won't be able to escape without someone's help. This activity is not recommended for those with already impaired circulation because making the knots too tight may further damage your circulatory system. Tie one end of the rope in a tight loop around your ankles. Use a square knot or granny knot to secure the loop (see Resources). The loop should be tight enough that you can't wiggle your ankles free but not so tight that you cut off circulation to your feet. Cues that the loop is too tight include pain, swelling, discoloration or numbness in your feet or ankles. Cut away excess rope from the loop around your ankles with sharp knife or shears. Clip off a piece of rope about 6 feet long. This will be used to secure your wrists. Lay the rope across your lap. Cross the ends loosely over each other and twist them once to make half a square or granny knot, then work both wrists into the large, loose loop you made. Grasp one end of the rope in your hands and the other end in your teeth. Pull both ends until the first half of the knot tightens around your wrists. Let the rope drop from your teeth down to near your hands. 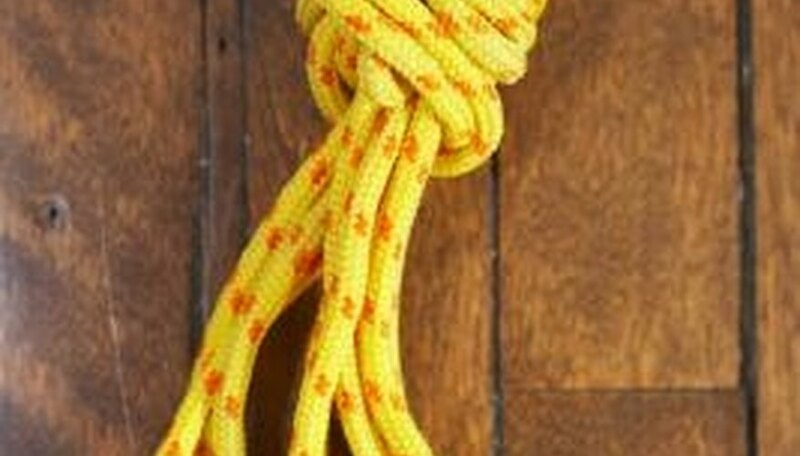 You should have enough hand dexterity to carefully cross and twist the ends of the rope around each other again, completing the second half of the knot. Lift one end of the rope up to your mouth and grasp it in your teeth, then pull at that end with your teeth and the other end with your hands. This will tighten the knot on the loop around your wrists. Ensure that the loop around your wrists is tight enough that you can't wiggle out of it but not so tight that it causes any pain, numbness, discomfort or discoloration in your wrists.